Of all the places we visited during our week in Vegas, Death Valley was my favorite, even better than the Grand Canyon. I fell in love with the place. We had saved Death Valley for the last day of our trip, knowing it would be a lot of driving (it turned out to be less than going to the Grand Canyon). 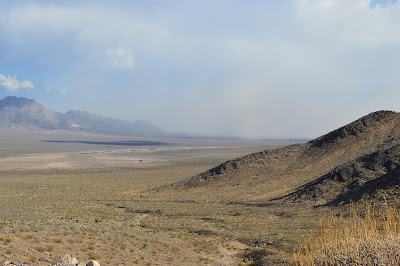 I've already described the first part of the day in my earlier post about Rhyolite, so we'll pick up from there. 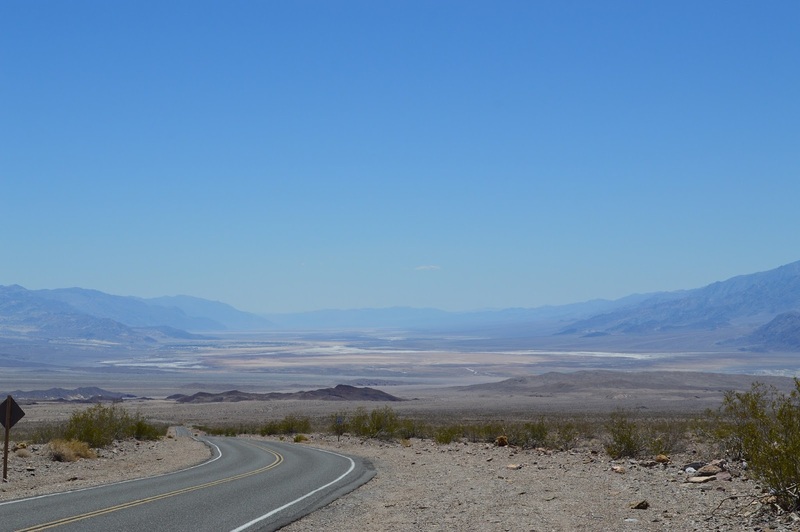 The Death Valley National Park website has a great downloadable pdf of driving routes from Las Vegas, so you can choose if you want to take the shortest route, the most scenic, etc. We chose to make our outward journey along the Ghost Town Route (taking in Rhyolite) and then return via the route listed as the most scenic. 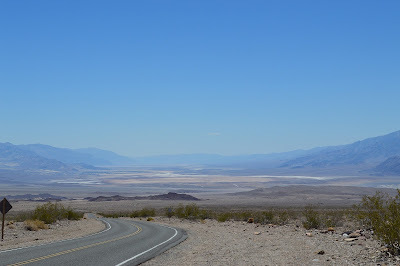 From Rhyolite, we continued driving on NV Hwy 374, across the state line into California and into Death Valley. As the mercury rose, miles of flat lay before us. At Hell's Gate, we took a left onto the Beatty Cut-off Road. I couldn't help but notice that the few other cars on the road all continued on 374. Did they know something we didn't? A few miles further and we noticed some ruins a little way off the road. We ignored the climbing temperatures; we were here to explore, and so explore we did. Harmony Borax Works was in operation from 1883-1888. 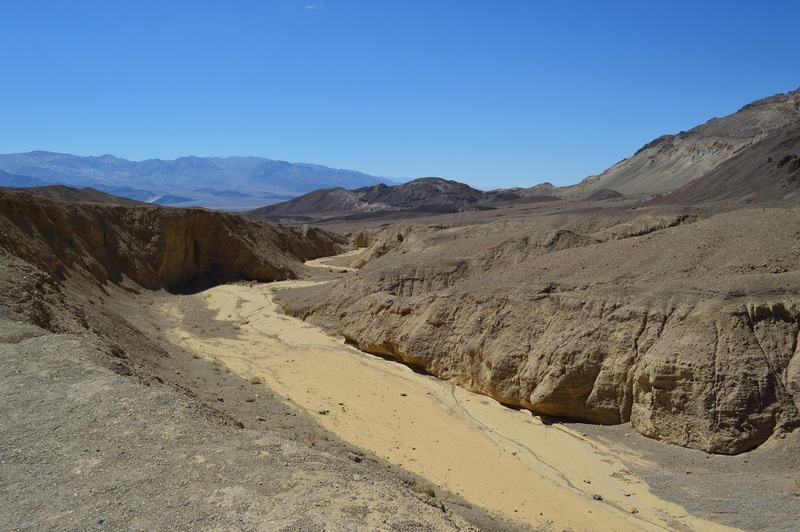 Borax was "the gold of Death Valley". I shuddered to imagine how they managed the heat (which by now was about 113 Fahrenheit) as they worked. 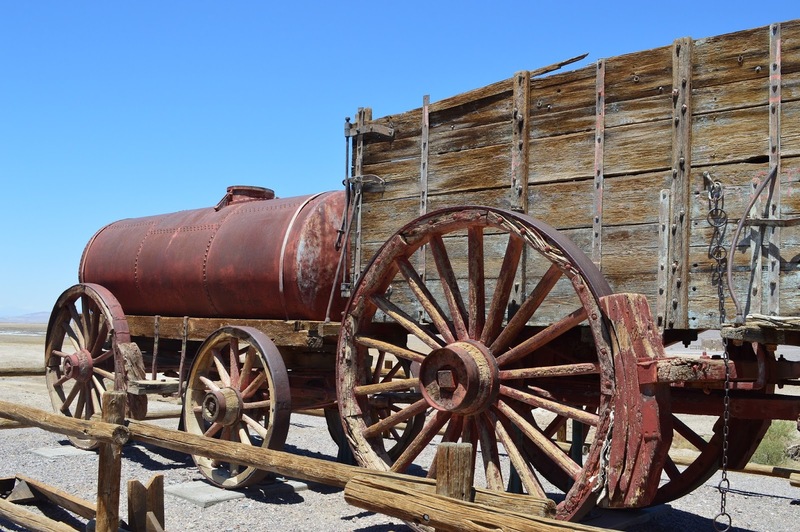 Once pulled by a 20-mule team to transport borax. Speaking of the heat, I was ridiculously excited about it by this point, insisting that we take a picture of the temperature reading every time it climbed a degree. After all, I didn't know how hot it would get and I didn't want to miss that all-important reading. Don't worry - I won't bore you with EVERY degree. Soon we reached Furnace Valley Visitor Center, where we refilled every water bottle in the car, using the handy-dandy refill fountains, browsed the visitor center, and bemoaned the lack of spoons. My mother collects them and they are becoming increasingly difficult to find - National Parks, take note! By this point we were getting rather hungry. The Visitor Center directed us to a campsite a mile or so down the road, complete with golf course, play area, souvenir shop (spoon!) and diner. Although puzzled to find that, even in the height of summer, the diner had a soup of the day, we enjoyed our sandwiches and fries before continuing on our way, now following the directions back to Vegas via the "most scenic route". Once we got back in the car, I resumed my habit of taking pictures of every view. Every few feet or so, I would insist we pull over so I could photograph the miles of nothing. And then, there it was. The magical 120 Fahrenheit. But no, still hotter it became. No longer able to get any reception on our phones, we were relying on the car's dash for outside temperature readings. Ladies and gentlemen, I give you 122 degrees! 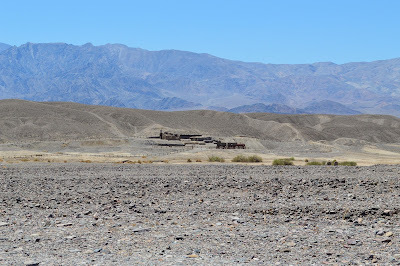 But back to Death Valley and the scenery. Now here's the part that puzzled me. 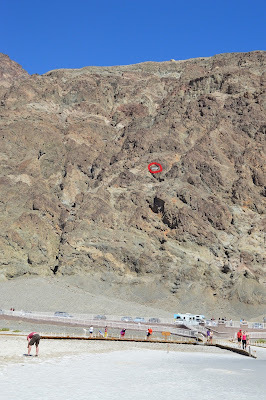 We were on Badwater Road when we saw the sign noting the turn-off to the Artist's Palette. I knew from reading up that this was the scenery we really wanted to see - a colorful blend of mineral-soaked rocks. But the few other cars on the road bypassed it completely. How often do you get to see this? Artist's Drive took us on a looping tour through the beautifully-colored rock formations. Words can't do them justice, and the changing position of the sun must surely mean that they always look different. I'll simply share some photos. 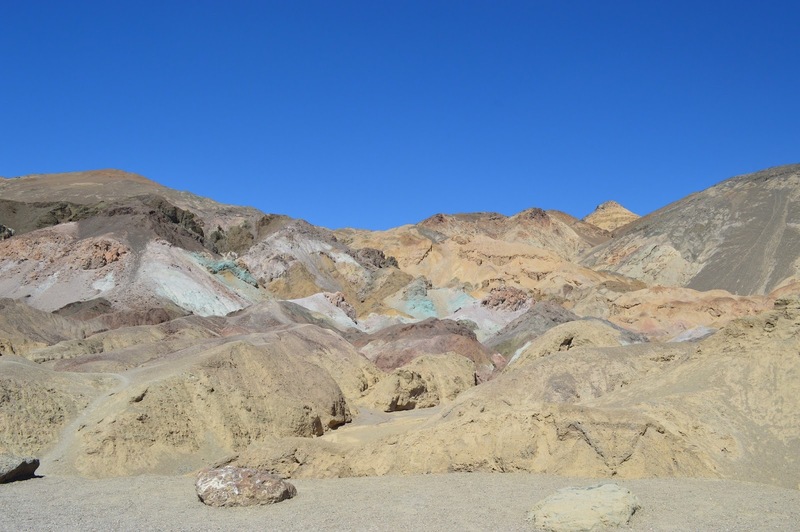 The layers of minerals include iron, aluminum, magnesium, titanium, red hematite, green chloride, and more. Magnificent. 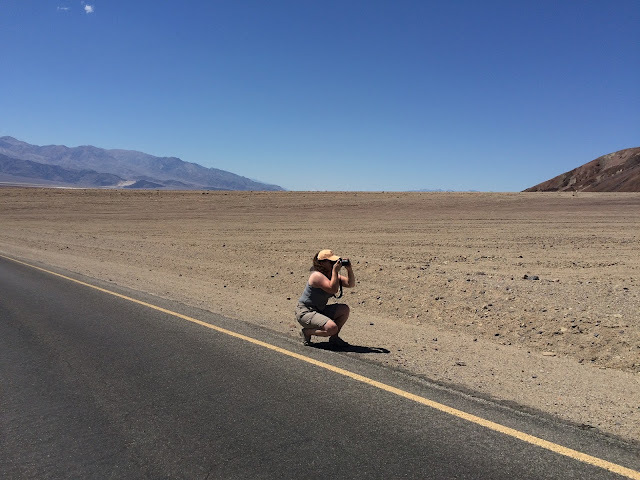 Once we rejoined the main road, we continued on to Badwater Basin, which holds the distinction of being the lowest spot in North America - 282 feet (855 meters) below sea level. For trivia fans, Mount Whitney, the highest spot in the contiguous 48, is just 84 miles away. I've circled it to make it easier for you! 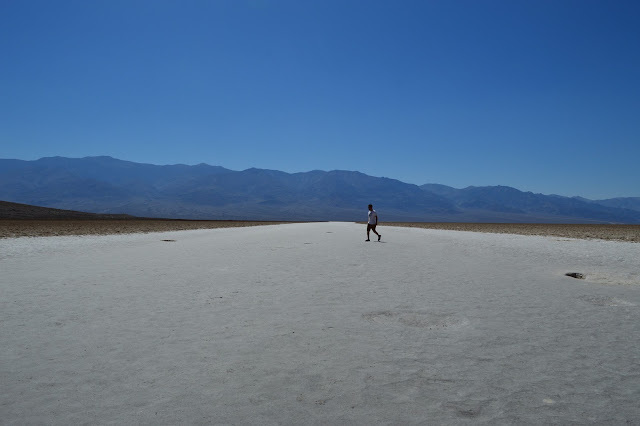 We emerged from the air-conditioned car to walk along the platforms by the delicate salt flats, and this is where the heat really started to feel intense. 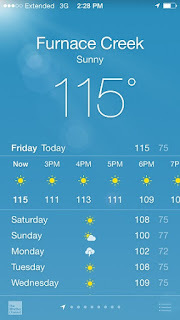 Have you ever been somewhere so hot that you feel as if you are standing in front of an open oven door? Somewhere so hot, that your hands are actually cooler when you put them IN your pockets because that removes them from the blasting dry heat? Even with plenty of water, after a few minutes I could feel my throat tightening from the heat. The air was so dry that all moisture evaporated immediately. I had finally met my match. 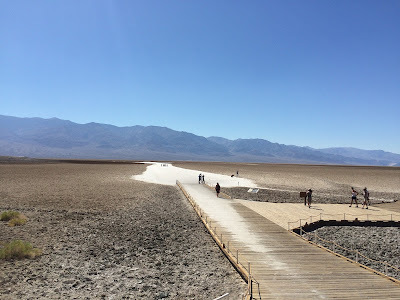 Wooden platforms protect the delicate salt flats. This is not the sort of place where you want your car to break down or where you want to be caught without water, hence our multiple bottles, all carefully refilled at Furnace Valley. While we're on the subject of your car breaking down, a few miles later we were worried that we may be developing a flat tire. The alarm light went off and I had visions of us needing to do a change in the infernal heat (I've always wanted to use that phrase!) Several checks showed no apparent problems with the tires, and we can only conclude that the extreme temperatures were confusing the gauges and the pressure sensors. 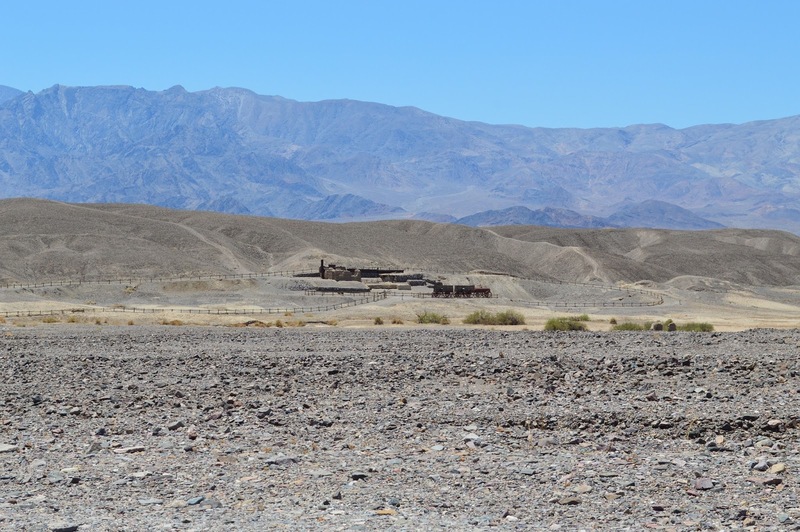 On we drove, and eventually we reached the edge of Death Valley, and signs of civilization. By civilization, I mean Shoshone, California, population: 31. If you were low on gas, this was your opportunity to fill up, for the princely sum of $5.50 a gallon. To be fair, this was miles from anywhere so the simple law of supply and demand was in evidence, although I suspect there may have been a cheaper, unadvertised rate for locals. St. Therese Mission, Tecopa, CA. 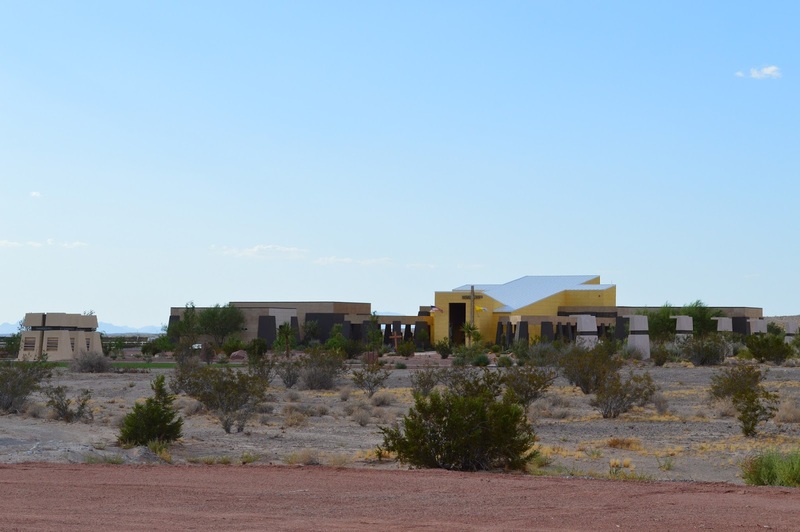 From Shoshone to Tecopa, a comparative boomtown with a population of 150 but lacking a gas station or grocery store. For those items, Shoshone had captured the market. 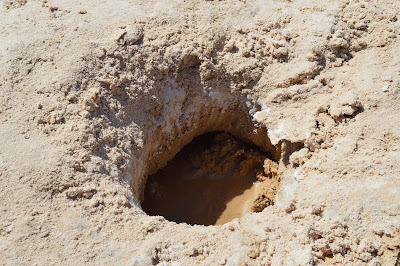 Tecopa is home to some natural hot springs which apparently attract quite a few visitors. At Tecopa, we joined the Old Spanish Trail, which would lead us back into Nevada to Hwy 160. This part of the drive was largely uneventful (despite signs promising what appeared to be happy dancing cows and deer). We did, however, pass the St. Therese Mission just outside Tecopa, and note what appeared to be a dust storm moving through the valley. Dust sweeps through the valley. 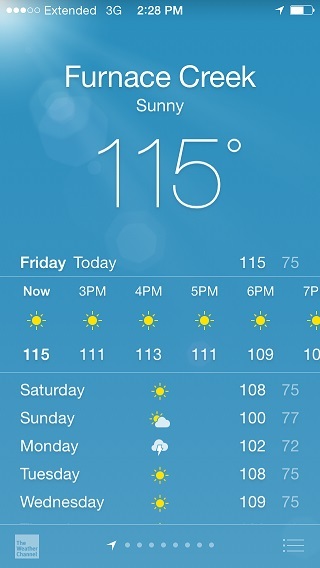 That evening in Vegas - a balmy 102 degrees - I found myself feeling a little chilly. I guess the heat had got to me, in more ways than one. 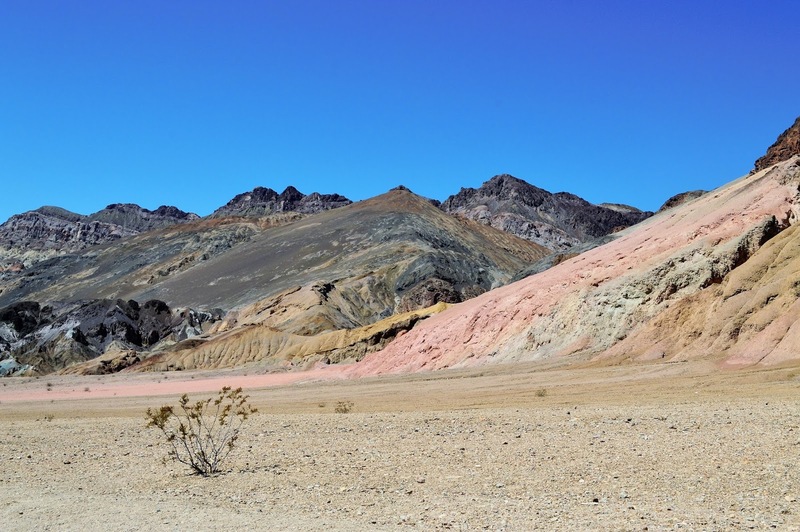 Death Valley was, without a doubt, my favorite part of the trip. It is a beautiful wilderness and experiencing it in such heat, it is almost unfathomable how people made their livelihoods out here. But they did, as the ruins of Rhyolite show. And they still do, as is evidenced in Shoshone and Tecopa. And back in the humidity of Kentucky the next day, I found myself uncomfortably sweaty and missing the dry heat of the desert. 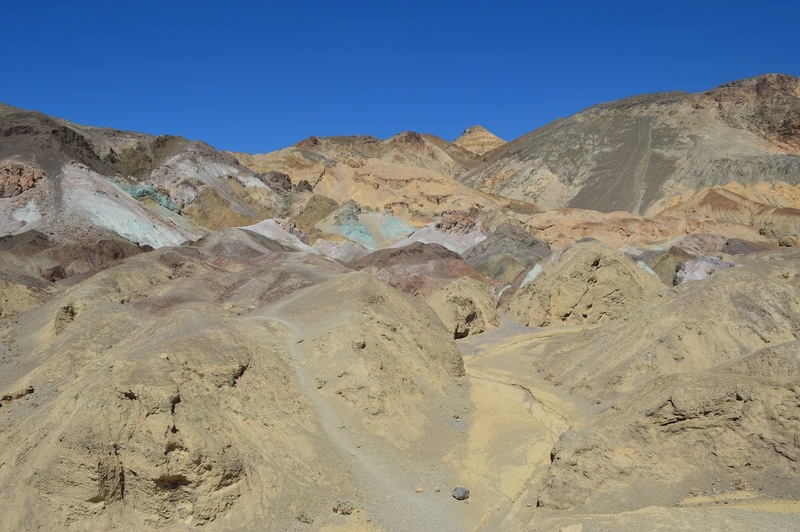 Labels: Artist's Palette, California, Death Valley, Furnace Valley, Hell's Gate, National Park, Rhyolite, Shoshone, Tecopa. Exploring Vegas - Fremont St.